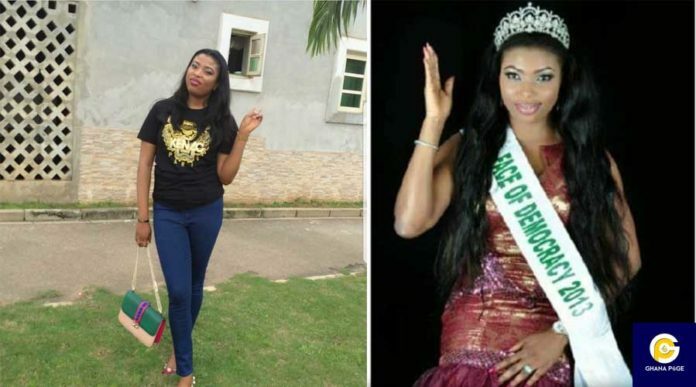 A Nigerian former beauty queen has passed away after she hired the services of a cosmetic surgeon for liposuction and fat transfer. The Face of Democracy Transformation 2013 winner Onwuzuligbo Nneka Miriam approached an American Surgeon based in Nigeria, Dr Anu for buttocks and hips enlargement that went wrong and resulted in her death. According to sources, Dr Anu who is believed to be a fake surgeon is on the run after the unfortunate incident happened. The surgery went soar when fats that were meant to be transferred to her hips got into her lungs and drifted into a coma. Miriam was immediately rushed to Vedic Hospital in Lekki where she was placed on life support and was later transferred to Lagos University Teaching Hospital where she passed away after 32 days in a coma. This is not the first time Dr Anu has conducted a surgery that went wrong. Recently, two Nigerian slay queens nearly lost their lives due to an improper shift of their buttocks during the surgery and had to be corrected in another hospital. According to reports, Dr Anu usually hires the services of foreign doctors to assist her in conducting the surgeries but decided to do this personally which went sour and resulted in the death of the former beauty queen. Currently, Dr Anu is nowhere to be found as she is on the run following the death of Onwuzuligbo Nneka Miriam.